Sometimes the most sublime foods are the most simple. Roasting potatoes isn't exactly rocket science, but the more I try different things, the more I realize there is some a little science behind making these potatoes simply delicious. 1. The potato: I use plain old russet. 2. The oven: 425 degrees...not too hot, but hot enough to give you a good crust. 3. The pan (this is key): Put the pan into the oven, by itself, while the oven is preheating, and allow it 5-10 minutes at 425 before you put the potatoes on it. Then, when you put the potatoes on the pan, they will instantly begin to lightly brown/crisp the bottoms of the potatoes, given you really nice crunch, followed by a soft interior. 5. 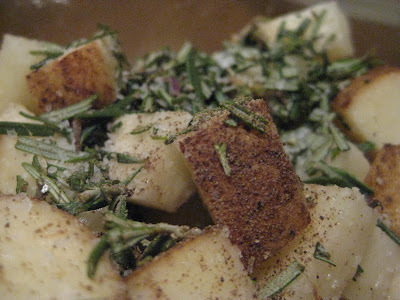 The seasoning: Plain 'ole salt and pepper works great, but if you are going to add herbs, please use fresh. Dried herbs have a tendency to burn at this high roasting temperature. 1 T fresh rosemary, minced. Preheat the oven to 425 degrees. 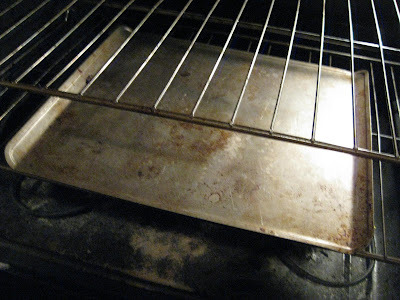 Place cookie sheet in the oven to heat. Mix all the other ingredients, stirring well to combine. After the cookie sheet has been in the oven for 10 minutes or so, carefully pour the potatoes onto the cookie sheet. 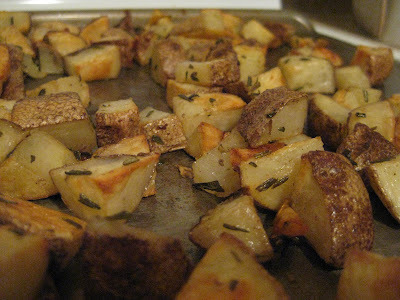 Roast for 15-18 minutes, then take a spatula, flip the potatoes and roast for another 15-20 minutes. These beauties go so well with any holiday or any-time-of-the-year meal! Wow. Your pictures make me crave those potatoes! I will have to try to heat the pan up before I put the potatoes on next time. I make those potatoes a lot and I never thought of preheating the pan. Thanks for the advice. Have a great weekend away. Hi there. We've not met yet, but I am Rookie Cookie's house elf, Megan. I am a cooking retard (I am so sorry for how un-PC that was, but if you take it literally, it actually is acurate), and I just needed to tell you how freaking brilliant I think heating the pan with the oven is. Love it. Will try it fo sure. It's so lovely to meet you. My kids have been in a sweet potato fries "jag." Your roasted potatoes look like the perfect side dish for a cold winter's day (it's 10 degrees out today w/ 8 new inches of snow). Glad I just discovered your blog from Super Health Kids. Glad to see you on SP&P Liz! My knees get weak over potatoes. Good thing I am sitting down. I love the whole pan in the oven first idea!!!! !